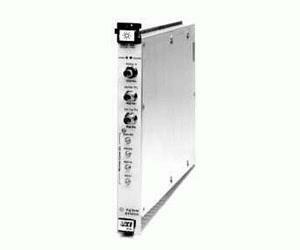 The Agilent E1430A high-resolution digitizer is a C-size, one-slot, register-based VXI module that can analyze spectra or capture transients, digitize IFs or record waveforms. The module includes DSP-based real time digital filtering with digital LO and large FIFO memories. The digitizer used in this module is a two-pass (or sub-ranging) type that provides 23 bits of raw resolution. The digitizer in the E1430A has low distortion with a noise density of -136 dBfs/Hz and a noise figure of 15 dB. The module comes with multistage digital filters built in with a maximum information bandwidth of 4 MHz. A high-speed 8 MB memory captures transients or acts as a FIFO for continuous digitizing during the block-mode data transfers used by some DSP algorithms. Data transfer is over the VXI data path and the high speed Local Bus (40 Mbytes/sec).